Dr. Maria Montessori was born August 30, 1870 in Italy. Today, we celebrate her work not as a philosopher but as an educator for young children. She was influenced by the works of Jean Itard, Edouard Seguin, Friedrich Frobel and Johann Heinrich Pestalozzi, all of whom emphasize sensory exploration and manipulations. She believed that when a child is presented with a rich environment of color, texture, shapes and sounds s/he gets enthralled with learning. Learning is a skill; it is a process of touching, feeling and comprehending with our senses. 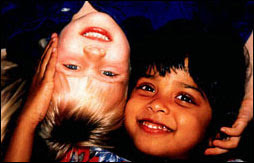 Dr. Maria Montessori began her work in India in 1939 and her work in India was continued by her students A.J. Joosten and S.R. Swamy. I was fortunate enough to be trained by Mr. S.R. Swamy. Today on her birthday we would like to recognize her contribution to early childhood education and creating this method that she presented during a time of great change. Her teaching methods have influenced generations of children to actively learn and explore the world around them.